The E-111 is a multi-colored dual rotating ball effect. It is powered by 2 x 120v 300w Lamps (EL-64514), and is compact in size. 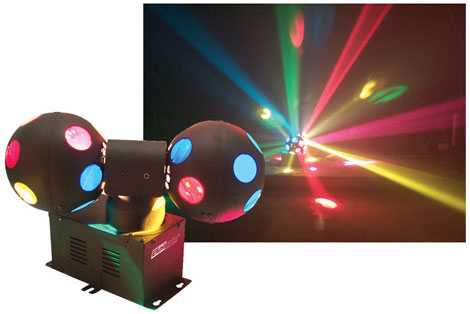 Great for clubs and mobile DJs, this unit gives you the coverage and brightness thats needed for most type applications. No music is needed for this unit, as it is an automatic rotating motor. Dimensions: 12"H x 16"W x 16"D, Weight: 10 lbs.